The Central Council for Research in Ayurvedic Sciences (CCRAS) and Central Council for Research in Unani medicine (CCRUM), both autonomous bodies under the Ministry of AYUSH have signed Memorandum of Understanding (MOU) for undertaking projects with ICMR under their respective schemes/ programmes. While CCRAS have undertaken collaborative projects in the field of Reproductive and Child Health (RCH) Programme, Golden Triangle Partnership (GTP) Scheme, Extra Mural Research (EMR) Scheme of Ministry of AYUSH; CCRUM is collaborating in the field of Tuberculosis with National Institute for Research in Tuberculosis (NIRT), Chennai, which is one of the premier institutes of ICMR. (i) Clinical protocols for Hypertension, Dyslipidemia, Osteoporosis, Rheumatoid Arthritis, HIV/AIDS, Oligospermia and Anxiety neurosis have been designed and drafted by ICMR. (ii) Reproductive and Child Health project has been completed. 17 coded formulations have been developed. (iii) Museum of Ethno medicinal plants of Western Ghats under EMR scheme have been completed. As an outcome, a publication on ‘Common medicinal plant for Home Remedies’ have been brought out. The Museum is serving as the IEC nodal Centre in the region for Medicinal Plants and Traditional Medicine. (iv) The reports on safety/ toxicity studies of Bhasma/ Rasushadhies have been received. Monograph of one Bhasma have been completed. (v) The study on biological activity of coded drug AYUSH-SL for Filariasis has been completed. In the field of Pulmonary tuberculosis, the Joint Working and monitoring Committee have identified the formulations with the objective to overcome the adverse/ side effects of Anti Tuberculosis Treatment (ATT) with the use of Unani drugs as adjuvant therapy. The Protocol for Pharmacokinetic study was prepared and got approved by the Scientific Advisory Committee of both the institutions. Ethics Committee of the NIRT has recommended undertaking preclinical studies of the Unani formulations on animals prior to conducting Pharmacokinetic study in human beings. In addition, Central Council for Research in Siddha (CCRS) is developing Protocols in consultation with ICMR institutions. This information was given the Minister of State (Independent Charge) of the Ministry of AYUSH, Shri Shripad Yesso Naik in reply to an unstarred question in the Rajya Sabha. The total plan actual expenditure incurred during the year 2014-15 is Rs.462.27 Crore for the development of AYUSH including AYUSH infrastructure. 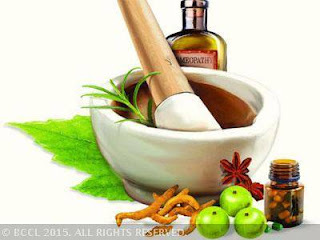 At present 89 posts of Ayurvedic doctors have been sanctioned in the Ministry of AYUSH, to be posted in the Ministry itself and Central Government Health Scheme (CGHS) Dispensaries of Government of India. Out of 89 posts sanctioned 67 posts are filled. However, the data on the number of AYUSH doctors posted in the hospitals under State/UT Governments is not maintained by Government of India. Further, as per the data received from States/UTs, 7,36,538 registered AYUSH practitioners are available in the country as on 01.04.2014. There is no plan to establish 18 AYUSH Colleges by the Government of India by itself. However, under section 13 A of Indian Medicine Central Council Act, 1970, permission was granted to establish 19 Ayurveda (01 Government and 18 Private) and 02 Unani Private Colleges in the academic session 2014-15. This information was given the Minister of State (Independent Charge) of the Ministry of AYUSH, Shri Shripad Yesso Naik in reply to an unstarred question in the RajyaSabha. Government of Indiaprovides Grant-in Aid to State/UT Governments for setting up of AYUSH Gram under AYUSH Services component of Centrally Sponsored Scheme of National AYUSH Mission (NAM). The total amount of Grant released under NAM for setting up of AYUSH Gram is Rs 215.15 lakhs. Government of India has created facilities for scientific validation of AYUSH systems of medicine through 5 Research Councils along with their peripheral institutions under the Ministry of AYUSH namely Central Council for Research in Ayurvedic Sciences (CCRAS), Central Council for Research in Yoga & Naturopathy (CCRYN), Central Council for Research in Unani Medicine (CCRUM), Central Council for Research in Siddha (CCRS) and Central Council for Research in Homoeopathy (CCRH). The Central Council for Research in Siddha (CCRS), an autonomous institution under Ministry of AYUSH through Siddha Central Research Institute, Chennai, Siddha Regional Research Institute and Siddha Central Research Unit (Palayamkottai) conducted a multicentric clinical trial in diabetes with the coded drugs D5 choorna and has obtained a patent for the same. This information was given by the Minister of State (Independent Charge) of the Ministry of AYUSH, Shri ShripadYessoNaik in a written reply to a starred question in the Rajya Sabha. . Regional Research Institute of Unani Medicine(RRIUM), D-11/1, AbulFazal Enclave, Jamia Nagar, Okhla, New Delhi – 110 025. Clinical Research Unit (Homoeopathy), 1st Cross, Mangalakshmi Nagar,(Behind New Bus Stand), Puducherry- 605013. Ayurveda Central Research Institute, Indira Colony, Bani Park, Jhotwara Road, Jaipur-302016. Adequate allocations have been made available for promotion of Ayurveda, Homoeopathy & Unani System of medicines in the country in the 12th Plan. Under Central Sector Schemes, the budgetary allocation of Funds for promotion of Ayurvedic systems for the year 2015-16 is Rs 256.43 cr (plan as well as non-plan). For the year 2014-15, the allocation was Rs 273.14 cr (plan plus non-plan). For promotion of Unani systems, budgetary allocation of funds during 2015-16 is Rs 148.63 cr (plan plus non-plan) . The allocation was Rs 143.9 cr during 2014-15. Under Central Sector Schemes there is no allocation to State Government separately. Under Centrally Sponsored Scheme of National AYUSH Mission (NAM), the amount allocated in the Budget for promotion of AYUSH which includes Ayurvedic, Homoeopathy and Unani Systems, is Rs 31699.99 lakhs during 2015-16 .The allocation for the year 2014-15 was Rs 18719.61 lakhs. Homoeopathic Medicines Pharmaceutical Co. Ltd. Amount allocated in the Budget for promotion of AYUSH to State Governments under Centrally Sponsored Scheme.